Joel Osteen. Your Best Life Now: 7 Steps to Living at Your Full Potential. Warner Faith, 2004 (original). 310 pp. $14.99. Joel Osteen is the pastor of Lakewood Baptist Church in Huston, Texas. He’s been the pastor there since 1999. Osteen is extremely popular. His sermons are broadcast all over the world. He even has his own Sirius radio station that plays 48 sermons a day (Channel 128, if you’re interested). And he has almost 4.5 million followers on Twitter. I’m one of them. Yet for all this popularity, lots of people don’t like him. Some of those who don’t like him do so because he smiles a lot and has a huge church (I mean, huuge!). I think these are poor reasons to not like the guy. I’ll point out some better ones in a minute. But before I do, I’ll say that in Your Best Life Now: 7 Steps to Living at Your Full Potential, I actually appreciate several things. For one, I appreciate Joel’s repeated expressions of affection for his father, the late John Osteen to whom the book is dedicated. At one point, I even teared up as Joel recounted the last time he saw his father alive (pp. 247-8). I also appreciated Osteen’s belief in the supernatural; our culture is losing this. “We serve a supernatural God,” he writes. “He is not limited to the laws of nature. He can do what human beings cannot do” (p. 127). I suppose I agree. However, all of us know people who speak well of their father. And all of us know people who believe in the supernatural. Neither of these—alone—makes a person a Christian. And this gets at my real frustration with the book: Your Best Life Now, though it fashions itself as a Christian book, is not. This probably sounds strange, even impossible, to some. I mean, the book has frequent mentions of God and the Bible. It offers a relentless pursuit of happiness and an inspiring plea for good deeds. This is what it means to be Christian, right? No, it’s not. These things, by themselves, are not necessarily Christian. Your Best Life Now is missing the thing that real Christianity has: the gospel. The gospel is the good news that sinners can be made right with God through the death and resurrection of Jesus Christ. The gospel answers why things are wrong in the world and what God has done, is doing, and will do to make them right again. And it’s this gospel message that is the basis of what it means to have an abundant, eternal life with God. Without the gospel, Christianity wouldn’t be Christianity. Therefore, because Your Best Life Now is missing the center of Christianity, any overlap or similarity with the real thing is only superficial. Even though Your Best Life Now was on the New York Times bestseller list for 200 weeks and has sold millions of copies, here are four ways that it promises not too much, but far too little. The title for the book is fitting. This book is about “now”—this moment, this earthly life. That’s fine, I suppose; some of the Bible is about this moment, this earthly life. But the impression that Osteen gives is that all of the Bible is about the now. And that’s not true. The Bible is about your best life “then.” It’s about the Holy Spirit being given to believers now as a “guarantee” or “down payment” (Ephesians 1:14) of a future life with God—a “then life,” which will last forever. Jesus said, “In the world you will have tribulation. But take heart; I have overcome the world” (John 16:33). And Paul told young believers “that through many tribulations we must enter the kingdom of God” (Acts 16:22). Osteen gets this emphasis wrong in so many places and so many ways, especially so as he talks about generosity. Osteen wrongly implies that if you give generously, God—who is watching closely—will repay you back in the “now.” In the Bible, you won’t find this Karma-like view of God, one who only—or even mainly—rewards and punishes in this life (1 Corinthians 15:19). The truth is, we all have areas in which we need to improve . . . . You may not be perfect—nobody is! Sure, you’ve got some flaws—we all do! But to be truly free, you must have a healthy respect for yourself in spite of those “imperfections” (p. 66). Or when talking about King David, Osteen writes, “David wasn’t perfect. He made mistakes . . .” (p. 192). David made mistakes? I’ll say! What the Bible actually teaches, is that not only are we imperfect, but apart from Christ, we “were dead in the trespasses and sins in which you once walked . . . . and were by nature children of wrath” (Ephesians 2:1-3). It’s true that our words and thoughts have power. Proverbs says, “Death and life are in the power of the tongue” (18:21). But in Osteen’s theology, they are too powerful, that is to say, words and thoughts become god-like, the authoritative determiner of one’s destiny. A positive outlook, he seems to argue, will always lead to a bright future; a negative outlook will always lead to a dark future. “You must conceive it and believe it is possible if you ever hope to experience it” (p. 4). “If you will change your thinking, God can change your life” (p. 32). “The truth is, you will never rise above the image you have of yourself in your own mind” (p. 56). There are dozens of these in the book. In several places, Osteen says that our thoughts can actually “stop God.” He writes, “When we focus on our disappointments, we stop God from bringing fresh new blessings into our lives” (p. 180). Really? We can “stop God”? It’s the frequency, and the strength, and the unqualified nature of these statements that I find so frustrating, so un-Christian. In real Christianity, God is God, and our thoughts and our words, while powerful, are not God. 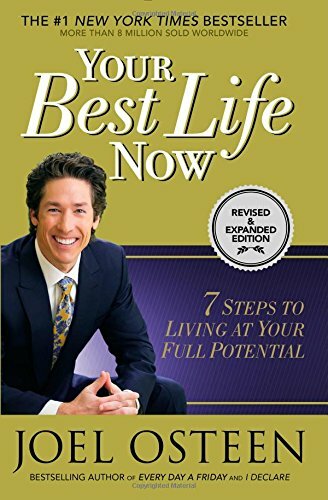 I’d love to tell you more about why Your Best Life Now is not a Christian book. I’d love to point out the way Osteen makes moral demands but does so without the gospel as the initiator, the generator of these good deeds. And I’d love to talk about the way that Osteen uses the Bible, especially the Old Testament, as merely a book of moral lessons for us to follow. And I’d love to talk about how Osteen is at the top of his own pyramid scheme, how he and his family are the exemplars and the proof texts for his own view of prosperity. And I’d love to talk about how in several of the passages where Osteen extolls the virtues of “hard work,” what he actually is depicting is an idolatrous worship of success. And I’d love to talk about how in the Bible the interplay between sin and sickness is far more nuanced and careful than Osteen’s “one-for-one” approach. And I’d love to talk about Osteen’s ambiguous use of the pronoun “you”; Osteen extends the blood-bought promises of God to everyone regardless of whether they have become a Christian or not. The result is that millions of unregenerate people try to live the Christian life without actually having it. Tragic. But as I said above, maybe another day. This last point (“The Wrong Story”) is my catch-all. When you compare the story that Osteen tells with the story that the Bible tells, they are just not the same. The Bible, though it has much to say to us, is not a story about us, most certainly not a story about one’s best life now. Rather, the Bible is The Story of God and his initiative to create a beautiful world, redeem it from brokenness, and exalt the glory of his grace. This difference is profound; it’s the difference between Christianity and everything else. It’s the difference between heaven and hell. And it’s the difference between Your Best Life Now and true Christianity.